contact NSF's Dena Headlee, dheadlee@nsf.gov 703-292-8070. Genetics reached a major milestone today as an international research team announced it has completed the first plant genome sequence. The species Arabidopsis thaliana has emerged as the plant counterpart of the laboratory mouse, offering clues to how all sorts of living organisms behave genetically, with potentially widespread applications for agriculture, medicine and energy. This achievement, by a consortium of scientists called the Arabidopsis Genome Initiative (AGI), becomes public on the cover of the journal Nature's December 14 issue, which includes four articles describing how researchers sequenced the entire genome of this weed in the mustard family. Because it is a model for over 250,000 other plant species, Arabidopsis is yielding insights that scientists are already applying to make other plants easier to grow under adverse conditions and healthier to eat. For the once-humble Arabidopsis, simplicity is truly a virtue. Its entire genome consists of a relatively small set of genes that dictate when the weed will bud, bloom, sleep or seed. Those functional genes have their counterparts in plants with much larger genomes, such as wheat, corn, rice, cotton and soybean. 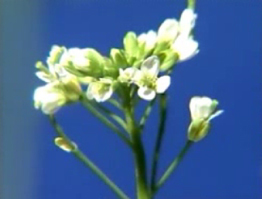 Unlike the human genome, Arabidopsis has few "junk" DNA sequences that contain no genes. The plant is practical for scientists because it matures quickly, is small and reproduces abundantly. All these physical and genetic traits add up to an especially useful organism whose genome is now catalogued for the public's benefit. "The Arabidopsis genome is entirely in the public domain, so the research results being announced today are immediately available to scientists across the world," said Daphne Preuss, an advisor to the AGI and a faculty member in the University of Chicago's Department of Molecular Genetics and Cell Biology. "Because its implications for farming, nutrition and medicine are potentially vast, this plant has gradually become quite indispensable to us." According to Nature, the number of scholarly publications on Arabidopsis has risen from about 300 in 1990 to more than 1,300 in 1998, the latest year in which complete figures were available. The journal anticipates about 1,700 articles for this year. The AGI is a collaboration of research groups in the U.S., Europe and Japan, funded by government agencies on three continents. National Science Foundation (NSF) Director Rita Colwell - whose agency provided substantial funding - emphasized that international cooperation was key to the project's success. "Today's news of the genome sequence completion could well mark the beginning of a whole new plant-genomics industry," Colwell said. "On behalf of U.S. funders including the Department of Energy and the Department of Agriculture, I thank our counterparts in the European Union, the French Government and the Chiba Prefectural Government of Japan." The complete sequence of Arabidopsis is directly relevant to human biological functions, because many fundamental life processes at the molecular and cellular levels are common to all higher organisms. Some of those processes are easier to study in Arabidopsis than in human or animal models. Arabidopsis contains numerous genes equivalent to those that prompt disease in humans -- ranging from cancer and premature aging, to ailments such as Wilson's disease, in which the human body's inability to excrete copper can be fatal. One result of the research has been crops that are more resistant to the cold. Because every molecular function of plants is dictated by DNA, an understanding of the genome could also help scientists develop crops that grow faster and larger, are more disease-resistant, and produce useful chemicals more efficiently. Arabidopsis researchers have also identified genes that determine whether the growing shoot of a plant will develop into a flower. By inserting a certain gene into poplar shoots, scientists have shortened that tree's flowering time from six years to only six months. To help researchers capitalize on the genome sequence, NSF has begun a "2010 Project" to determine the function of 25,000 Arabidopsis genes over the next decade. The NSF 2010 Project is part of a worldwide Arabidopsis functional genomics effort and will be coordinated in a similar manner to the Arabidopsis genome sequencing project. Plants hold great potential as sources of renewable energy, although they currently represent just three percent of U.S. energy resources. Completion of the Arabidopsis genome sequence is revealing how photosynthesis converts solar energy and carbon dioxide into biomass, helping scientists develop better plants for fuel and chemical uses. The Arabidopsis initiative also demonstrates how information technology (IT) is revolutionizing biology research. Without advanced computers and networks, the genome's usefulness would not be as extensive. Biologists are the fastest-growing segment of IT users in the scientific community, with the field of "bioinformatics" producing more-powerful databases and pattern recognition tools for DNA analysis. List of related Arabidopsis links. NSF is an independent federal agency which supports fundamental research and education across all fields of science and engineering, with an annual budget of about $4 billion. NSF funds reach all 50 states, through grants to about 1,600 universities and institutions nationwide. Each year, NSF receives about 30,000 competitive requests for funding, and makes about 10,000 funding awards. For instant information about NSF, sign up for the Custom News Service. From the toolbar on NSF's home page, (http://www.nsf.gov), sign up to receive electronic versions of NSF news, studies, publications and reports. Follow the simple sign-on procedures that guide you to your choices. Also see NSF news products at: http://www.nsf.gov/od/lpa/start.htm, http://www.eurekalert.org, and http://www.ari.net/newswise.